Wedding Balloon Dress: A Bold Break From Tradition! Chuck and Julie’s wedding was the perfect example of how balloons can add a unique, fun flair without diminishing class or sophistication. The bride and groom had so much fun getting married on the beach while she was wearing such a unique wedding dress. 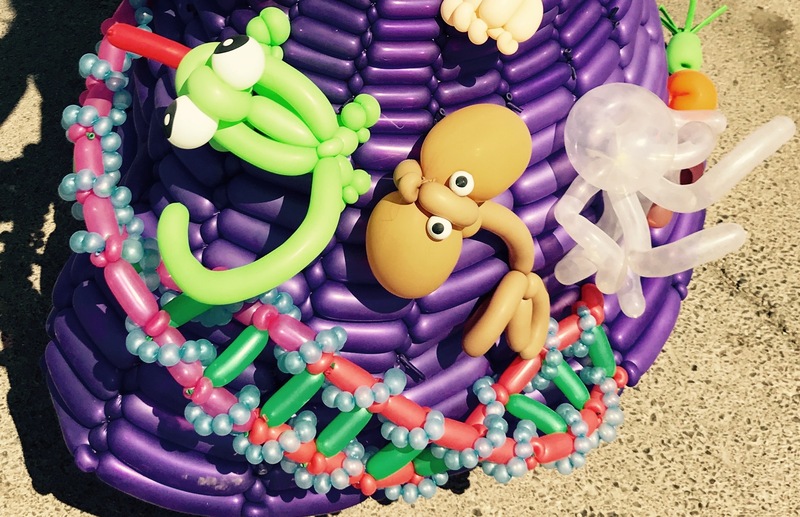 All of the accessories were made using non-inflated balloons wrapped around wires. 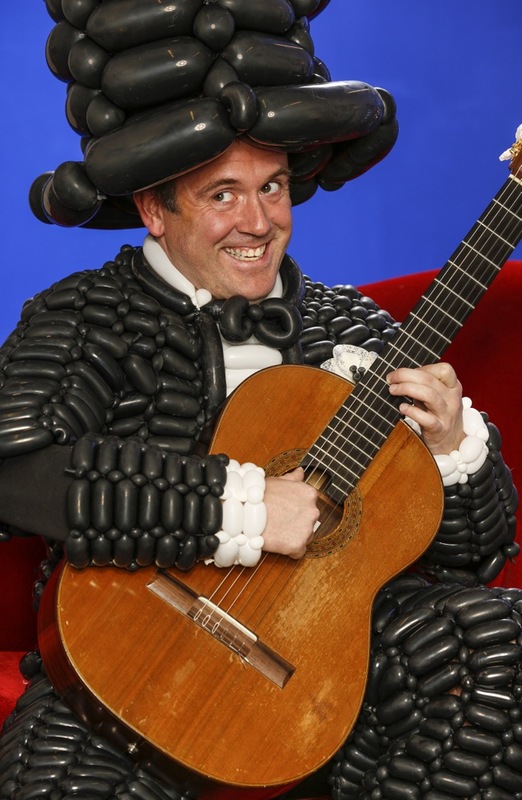 The balloon necklace was made using the nozzles of about 30 balloons. Even the bouquet was made out of balloons. A Modern Approach To the Classic! Wearing a beautiful white wedding dress is a time honored tradition we wanted to keep in tact. Working together on the design, I feel like this wedding balloon dress was a creative, modern contribution to that tradition. Thanks to the workability of balloons, I was able to cater to the exact silhouette, and style that would make Julie feel as comfortable and beautiful as possible. This adorable couple “tie the knot” with a clever magic trick! 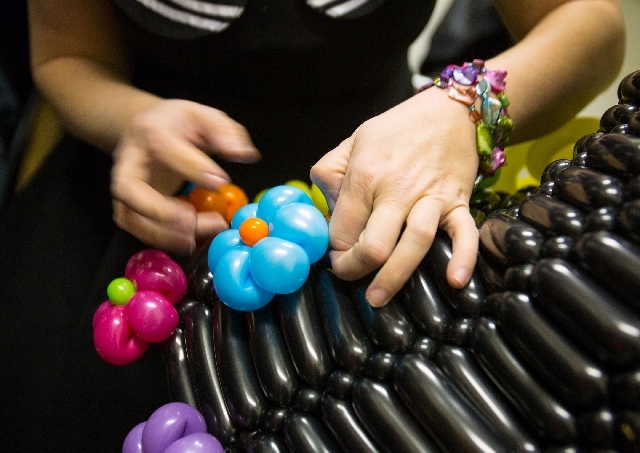 Using non-inflated balloons wrapped around wires to create the complex design on the back of the dress, as well as the flower accessories the ENTIRE dress is made out of balloons. All of Chuck and Julie’s accessories, including the necklace, bouquets, boutonnieres, and hair pin were made in advance. All in all, over 40 hours and 1000 balloons went into making this wedding balloon dress. What Happens If A Balloon Pops? Because this particular wedding was taking place in Riviera Maya, on the beach, in August the heat and humidity were serious concerns. To counteract the danger of her balloon dress popping, each of the balloons were filled with confetti. That way, should any of them have popped, colorful confetti would have bust out of them, making it seem like an intentional “bonus” feature of the dress! Side note: not a single balloon popped. To be honest, we were almost disappointed! A high quality balloon makes all the difference in the world. What comes up, must come down. Or in this case, what’s inflated, must be deflated… eventually! After the balloon wedding dress had done its job to perfection, it was time for it to be deflated in style – what better way to do the dress justice than to have a “trash the dress party” that would allow the dress to provide as much fun in its deflation as it had while it was still in full form! As soon as we threw the bride into the pool we knew we were in for an unique adventure – the dress wasn’t going to go down without a fight! The bride floated around the pool all day and even managed to play water volleyball in the balloon gown! Unfortunately, balloon dresses only last so long. Luckily Julie had a fantastic photographer to capture these wonderful memories. So a special thanks to Richard Faverty at Beckett Studios for the amazing pictures! The March for Science is a grassroots movement to “champion science as a pillar of human freedom and prosperity.” We march to advocate science’s important role in policy making and reform. This year World Inflated created a balloon dress for the March for Science to show our support. The dress was created by Tawney B, and showcases several different branches of science.